Eliminate glare and create the ultimate viewing experience in your media room with shades. When you’re ready to watch a move simply close the shades using the remote from the comfort of your couch. 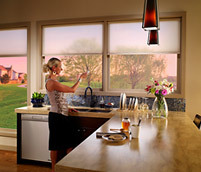 Adjust second-story shades safely and effortlessly. Thanks to battery power, the touch of a button will let you operate your shades from anywhere in the room. Control your shades in conjunction with your lights, and transform your space for any activity. Sivoia QS Triathlon shades are the only battery-powered shades available today that integrate seamlessly with a whole-home control system such as RadioRA 2 or HomeWorks QS.